﻿What Does "High Oleic" Mean? "High oleic" is a term used to describe the type of healthy fats found in sunflower oil. It begins with us choosing variety-specific seed which produces the highest levels of Omega 9 fats. High Oleic: This means the oil contains high levels of Oleic Acid. This fat is the main fat found in our skin and adipose tissue (body fat). It is what we are composed of, and in order to build a healthy body it is what we should consume in our food. Vitamin E: An antioxidant found in foods that acts to protect oils and our body's tissues from oxidative damage. Sunflower oil is the second-highest food source of Vitamin E after wheat germ oil. The antioxidant effect of Vitamin E keeps our oil from oxidizing and extends the freshness of the oil. Oxidative testing has shown great resistance to spoilage over time for our sunflower oil. ﻿What is a Smoke Point? Smoke Point: The point at which an oil (or the constituents within the oil) will begin to break down and burn. This indicates extreme oxidation of the oil and leads to spoilage of the oil. The higher the smoke point, the hotter the temperature at which you can cook with it. Our high-oleic organic sunflower oil has performed to a smoke point above 400 degrees Fahrenheit, which allows it to be used for deep frying (something you can't do with olive oil). Smoke points can vary based on many different factors, which is why you will see differing numbers all over the internet. We test our smoke points in house to insure optimal accuracy. Monounsaturated Fat: Monounsaturated fats have one double bond, or one site of unsaturation. This oil is more resistant to oxidation and the formation of trans fats when used in cooking than polyunsaturated fats are. Oleic Acid is a monounsaturated fat. ﻿What does cooking the oil do to toxins in cooking oil? The wide array of cooking oils on the store shelf can be confusing. Oils containing a list of ingredients, other than only the oil itself, means it has probably been processed using chemicals and in all likelihood has some residual toxins. Century Sun Sunflower Oil is produced without the use of any chemicals, which assures that the naturally-occurring constituents like Vitamins E and K and phytosterols are retained. These powerful antioxidants reduce the likelihood of free radical formation during the cooking process. ﻿Can I use Century Sun Oil like I use extra virgin olive oil? Actually, because of its mild flavor and slightly nutty taste, Century Sun Sunflower Oil is more versatile than extra virgin olive oil. The many uses include pan frying, deep frying and stir frying as well as all of your favorite baked goods and salad dressings. Great for making popcorn too! ﻿Cold pressed means our extruder press does not operate at temperatures over 110 degrees. Careful monitoring of our processing shows our oil rarely exceeds 100 degrees during pressing. We carefully inspect the product every step of the way to insure the highest quality oil is put into our bottles. How do we choose the farmers that grow our sunflower seeds? We work with several local Certified Organic farmers that pay close attention to soil health and work to improve diversity on their farms. 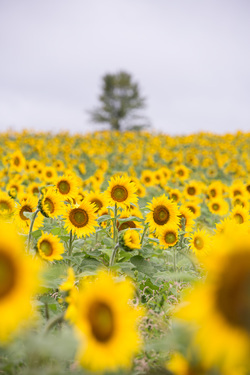 All of our farmers plant high-oleic sunflower seeds (chosen by Century Sun Oil) within a tight crop rotation to eliminate the need for any pesticides and grow the best quality that nature provides. By not growing the same crop year after year on the same field, nature has an opportunity to balance itself on an ongoing basis. Healthy soil equates to healthy crops and ultimately healthy people. This is where REAL health care begins! ﻿﻿Century Sun Oil, LLC, is committed to working with local farmers to access their certified organic sunflower seeds. "Local" means having the unique ability to provide the highest-quality product as shipping, storage and production time from field to your dinner table is reduced. Working hand-in-hand with our growers to insure the integrity and quality of the sunflowers from planting to harvest is easy, as they are located within a short driving distance of our on-farm storage and processing facility. Small businesses helping each other grow is the backbone of a healthy economy as well.